Once you get a taste for dyeing with plants, you start to question the potential of everything around you: plants in your garden and surrounding landscape, your fridge, your food cupboard and even your medicine cabinet if you’re into herbs! I recently bought a bunch of purple basil to infuse in oil and serve with baked vegetables; rather than leaving the remaining half-bunch to turn to sludge in the fridge, I simmered it in water for 45min, strained the leaves out and added some yarn pre-mordanted in alum and cream of tartar to see if any of the dark red of the dyebath would bond to it. Interestingly, the wool/ silk took up a lot of colour, while the wool just a touch, whereas sometimes the opposite happens. I’m starting to think there must be affinities between certain plant pigments and certain fibres… or perhaps the capacity for bonding is pH-related. It’s an enigmatic art. 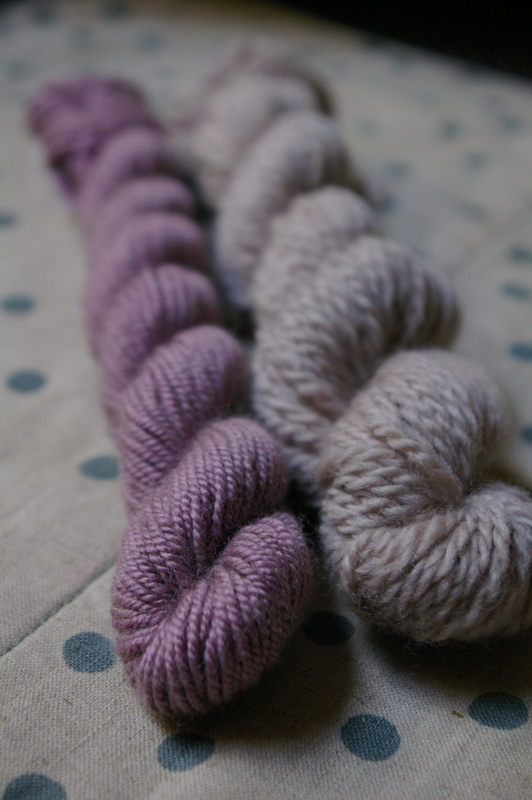 This entry was posted in dyeing, knitting and yarn, plants and tagged dyeing with purple basil, natural dyeing, plant dyeing, textiles. yarn on June 25, 2013 by admin. Looks lovely! Is it Ocimum tenuiflorum/sanctum, also known as holy or thai basil? It’s being investigated in India as a commercial natural dye (green with iron, I’ve heard). I have got to harvest some of this and try it! Lovely! Theres a lot growing in the garden. I will trey this. No alum available (I’m on vacation) so i guess it will be a very light color. Good to read this post before i begin. It sure is a lovely colour, Jule! I look forward to seeing what you get from it too!